THE MOMENT OF PUTH: Climbing from 2-1 to score his second #1 on the Top 40 chart, it’s Charlie Puth with “Attention”. He last hit the top in 2015 as the featured artist on Wiz Khalifa‘s “See You Again”, which spent four weeks at #1 that May and June. In Top 40 history, there has never been a title (until Puth’s) to include the word attention in it, though it’s obviously a common term in the English language. Well, I guess we’re giving it some well-deserved attention now. It should easily spend a few weeks at #1 on the pop chart, largely because a number of songs are falling out of the top five, as well as the upcoming Labor Day holiday, when several stations on the panel air specialty programming. The first week for “Attention” at #1 marks the 16th week in 2017 that a male soloist has occupied the top spot on the survey, with Ed Sheeran (ten weeks), Bruno Mars (three weeks) and Shawn Mendes (two weeks) also contributing to that total. The guys seem to be on a hot streak, what can I say? Does it continue through the end of the year? Will the women make a comeback? Stay tuned. SHE’S GOT THE “LOOK”: Well, she sure knows how to make an entrance! Superstar Taylor Swift blasts into the countdown at #22 with “Look What You Made Me Do”, the lead single from her forthcoming album Reputation. The single soared to #1 on iTunes under an hour after its initial release late Thursday night, and has stayed there ever since. A music video for it premiered on Sunday night during MTV’s Video Music Awards. Swift’s hit would’ve debuted at #21, like the Sunday morning update, but Friday data from KKPN/Corpus Christi was removed from the published update, as the station was knocked off the air during Hurricane Harvey. Due to this, there’s a difference in 18 spins, thus, it falls a notch. Still, that giant entry is an amazing achievement. Looking for all the format’s #1 lookers? You’ll remember “I Still Haven’t Found What I’m Looking For” by U2 (7/31/87 R&R), “Look Away” by Chicago (12/2-9/88 R&R), “The Look” by Roxette (3/31/89 R&R), and “Looking Through Patient Eyes” by P.M. Dawn (5/7-14/93 R&R). Swift could swiftly bring that count to five, given her release’s fast ascent since Friday, but we’ll have to wait to see how it progresses. “MIND” THE GAP: All aboard! Here comes the debut train, rolling down the tracks! Five new entries (okay, tracks!) reach the top 50 this week, led by five newcomers who call themselves PRETTYMUCH. Their debut single, “Would You Mind”, climbs in at #44. The quintet is Simon Cowell’s new boy band, and their splashy start is certainly a positive sign for the next few weeks. The Script is two notches below them, at #46, with their first chart song since the beginning of 2015: “Rain”. The Irish trio last hit the top 40 here in early 2013 with “Hall Of Fame”, which spent two weeks at #16. “Wish I Knew You” from The Revivalists lands at #47, marking their first chart entry at the format. This track previously hit #1 on both the Alternative and Triple A charts, while it remains in the top 15 on the Hot AC survey. Sibling trio AJR is A-OK with entering at #48 with “Drama”, which looks to follow “Weak” into the top 40. That streaming hit spent two weeks at #27 in June. Finally, in at #49, DeJ Loaf makes her debut at the format with “No Fear”. The Detroit rapper has previously charted with several singles on the Rhythmic and Urban surveys, reaching #1 on the latter list with “Try Me” in early 2015. Check back to see how all five of these songs do! WHO’S GOT YOUR “BACK” NOW? : Settling just over 100 spins above his nearest competitor, Shawn Mendes holds atop the pop survey for a second week with “There’s Nothing Holdin’ Me Back”. Look for it to reach the top of the Hot AC chart next week. In addition to those two formats, it also climbs 11-8 on AC radio this week, while it’s just below the top 50 on the Rhythmic list. (A new remix featuring Gucci Mane and Quavo might be needed for it to officially chart there.) Mendes has yet to announce a next single from his Illuminate album, or if he’ll be moving on from that era, but I’ll continue to look out for any information once it’s out there. Meanwhile, I’m sure Mr. Mendes is enjoying the continued love from programmers around the country. “FRIENDS” IN HIGH PLACES: Just in case you haven’t had enough Justin Bieber this year, his fourth top 40 collaboration of 2017 debuts at #35 this week. “Friends” gives Bieber his 23rd top 40 hit since 2009, but it also marks the artist debut of BloodPop, the writer and producer born Michael Tucker. He has a total of three top 40 singles to date from behind the boards, including the #1 hit “Sorry” for Bieber, which spent three weeks at the top in December 2015 and January 2016. Will the Canadian superstar grab his second #1 this year, while making the American producer a household name? It’s definitely possible. I’ll be rooting for it! A notch below “Friends” is “Two Ghosts” by Harry Styles, up from 41-36. It’s the second top 40 hit from his self-titled solo release. Of course, this means that every member of the original lineup of One Direction, except ZAYN, has at least one title in the top 40. (Oh, ZAYN, where art thou?) Styles’s song is seeing a slow start in digital sales, but it’s still early on in its run. There are a number of great cuts still left on that album, if this one doesn’t work out as a radio single in the long run. WHAT’S SO “BAD” ABOUT THEM? : Well, in the eyes of many pop fans, nothing at all! There are three new songs in the top 50 portion of the chart this week, all by solo women. The highest of the three is the fifth chart single for Halsey, coming in at #45. This hit, titled “Bad At Love”, is the follow-up to “Now Or Never”, which peaked at #3 three weeks ago. Both tracks are taken from the set titled Hopeless Fountain Kingdom, which debuted at #1 on the Billboard 200 earlier this year. Though she hasn’t equaled the major success of ten-week chart-topper “Closer” by The Chainsmokers, on which she appeared as the featured vocalist, this song will be around well into the fall, so watch out for it. The other two performers debuting in the countdown land just below Halsey’s new entry, with “New Rules” (#46) by Dua Lipa and “Why” (#47) by Sabrina Carpenter adding some girl power to the top 50. Lipa has now entered the top 50 with five tracks, two of which were collaborations with other artists. She has yet to score a top ten song. Carpenter made her debut at the pop format earlier this year with “Thumbs”, which peaked at #26 for two weeks in March and April. Her new radio hit was the second Most Added title here last week. HIGHLY MILEY: After debuting at #37 on the published update last Sunday, Miley Cyrus easily claims this week’s Most Added song at the CHR format with “Malibu”. The track surfs in with 116 adds. Hole‘s “Malibu”, which was mentioned briefly in Sunday’s post, received 42 adds on impact (the second Most Added song that week, behind Alanis Morissette‘s “Unsent” with 95 adds) on its way to a peak of #35 in February 1999. While the state of California resides in a number of top 40 titles throughout the decades, the cities and towns located on the musical map of The Golden State include Beverly Hills, Hollywood, Los Angeles, Monterey, San Francisco, San José, Sausalito and Ventura. (Of course, Malibu brings that total up by one.) Look out for Cyrus’s next studio album later this year, which you can purchase in Malibu, or pretty much anywhere else in the world. CHILDISH BEHAVIOR: The performer known as Childish Gambino has charted with two minor singles so far this decade: a top 50 entry called “Heartbeat” (#43, 3/4/12) and the top 40 entry “V. 3005″ (#38, 9/14-21 and 10/5/14). Needless to say, the pop panel and the performer don’t exactly have a relationship that’s hand in Glover; at least, not at this point. However, that isn’t going to stop the California artist from trying for his second top 40 single at the format with “Redbone”. The current #1 on the Urban AC chart, which also ranks in the top ten at Urban radio and top 15 at Rhythmic, impacts with 14 stations this week, which gives it a tied total for the 8th Most Added spot. We’ll see if the children drive Childish to his biggest pop hit yet this summer. Top 40 Trivia: This Irish trio had a lot to celebrate with their latest era, as it continued to do very well on my survey. The three guys landed two number-one songs, one of which is still to come, and this additional top five, extending their top ten streak to ten in a row. The video, as well as the “Superheroes” clip, was filmed in South Africa, a country that gave us several chart acts in 2015. Top 40 Trivia: This year was extra… sugary at radio across all formats. At least five of them were serviced: following this was a song called “Sugar, You” by Oh Honey at Hot AC, then “Sugar” by Jennifer Nettles at Country, a different tune titled “Sugar” by Sister Sparrow & The Dirty Birds at AAA, and finally, “Sugar” by Robin Schulz and Francesco Yates at CHR/Top 40. Top 40 Trivia: The phrase “go big or go home” originated from a piece of branding by a company called Porker Pipes. Based in California, they created a line of exhaust systems for Harley-Davidson motorcycles about two decades ago. Of course, we hear it a lot today, mostly in the context of sports. However, it was inevitable that those five words would show up in a song or two as well. Top 40 Trivia: Mendes’s song took a lengthy 23 weeks to hit #1 on the CHR/Top 40 chart, longer than any other chart entry in 2015. If you’re wondering if that’s a record, it’s close, but not quite. That title still belongs to 2012’s “Give Your Heart A Break” by Demi Lovato, which hit #1 in its 25th week. Mendes’s new duet with Camila Cabello could be a record to watch there in 2016. Top 40 Trivia: This boy band has one more song in the countdown that they recorded as a quartet, but it was “Night” that lives on as their last official single under their original lineup (including member Zayn Malik.) Malik quit the band pretty close to when this song peaked at radio, though it was already descending on my chart for several weeks. The group goes on a hiatus fairly soon. Top 40 Trivia: Swift’s 1989 is going for a sixth #1 on the CHR/Top 40 chart next year, as “Out Of The Woods” will be, well, out on the charts in a big way. Katy Perry’s Teenage Dream managed to accomplish the feat between 2010 and 2012, and perhaps the bad blood between them (allegedly) is serving as fuel for the 26-year-old singer. She has one more entry to come on the Top 100. Top 40 Trivia: 2015 was a great year for Country crossovers on my top 40. Four of them entered the chart, with one of them in the running to be a smash on next year’s Top 100 (Thomas Rhett‘s “Die A Happy Man”, which climbed to #32 on the weekly list at the close of the chart year.) Hunt’s release was the biggest, and he’s now competing for Best New Artist at the Grammy Awards. Top 40 Trivia: On the last chart of the 2014 Chart Year, this song began its run at the top. Had all of its weeks been included on this year’s survey, I’m sure it would have been way higher. Alas, “Shut” had a massive 36-week run on my chart and might be their biggest hit for me for some time. If you want to do some more dancing, the third and final of those titles is on the way tomorrow. Top 40 Trivia: Perhaps a new fun. era would have been better than what occurred this year for Ruess’s first solo outing. No, it wasn’t particularly grand or romantic to see his debut album dive after its first week or to see this single bottom out quickly, but I still thought it was solid. Past “Nothing” songs to go top ten on my list include ones by Mat Kearney, O-Town and The Script. Top 40 Trivia: The letter X marks a tiny spot in top 40 radio history, as only one act (prior to this one) and one song beginning with the letter had ever reached that portion of the chart. In November 1993, the R&B group Xscape went to #8 with their debut single, “Just Kickin’ It”. In September 1980, “Xanadu”, by Olivia Newton-John and the Electric Light Orchestra, got to #2. Tomorrow, we’ll reveal #’s 20 through 11, so check back then! You can always follow and listen to the Top 100 reveal on Spotify. Saying “uh huh” to a second week at the top. Irish singer Gavin James remains one of this year’s top newcomers on my personal chart, having just fallen out of #1 a few weeks ago with his remake of “The Book Of Love”. (It holds at #5 this week.) Although “Book” wasn’t pushed at radio here, a new single from James is. That would be “Bitter Pill”, which comes in at #36 as the Highest Debut in the top 40. “Bitter” was co-written by a chart favorite, Jamie Scott, who also had a hand in writing One Direction‘s “Drag Me Down”, up 27-18 as the week’s Biggest Mover for the second chart in a row. Four years ago, a quartet called Lakoda Rayne was featured on the first season of the U.S. version of The X Factor, and they made the top ten in the competition. Unfortunately, the ladies took ninth place, and have since broken up. Now, 21-year-old Cari Fletcher, performing as FLETCHER, is buzzing as a solo act with a track that’s accumulated nearly 5.4 million plays on Spotify. She debuts at #37 with “War Paint”. Watch out for more on this glossy gem as the months go on. The California band called Saint Motel spent four weeks at #1 with “My Type”, and while that falls out of the countdown, a second song from them enters at #39. “Cold Cold Man” is taken from the same EP as their prior single and heads for adds at Alternative radio in a week and a half. The group has a number of U.S. tour dates planned through the fall, including opener sets for Nate Ruess and Walk The Moon. Finally, down at #40, is the first chart single for Jarryd James. The singer/songwriter from Brisbane climbed to a #2 peak in his native Australia with the independently-released “Do You Remember”, which has since been reissued by a major label. A full-length album is due this fall. All chart roads lead to ROMANS. 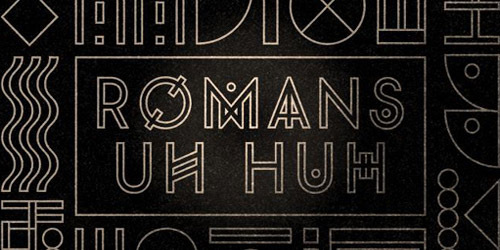 We have a new one at the top this week, as singer, songwriter and producer Sam Roman, better known as just ROMANS, is up 2-1 with his first single to reach my top 40, “Uh Huh”. That achievement makes him the fifth artist this year to hit the top of my chart during their first run up my list, which is an unusually high number of acts, but not a record (well, not yet.) Look out for the song at the Hot AC format when it goes for adds this week; fingers crossed that it will have an awesome result! 27-year-old Australian singer Conrad Sewell lands this week’s Highest Debut at #39 with “Hold Me Up”. It’s the first time on the chart for the performer from Brisbane, though he’s already gone to #1 in his native country with another tune, “Start Again”. We’ll see what happens with Sewell’s first U.S. release when it goes for adds at pop radio this week. Additionally, it’s the first song to rank for label 300 Entertainment, who previously bubbled under with Jacquie Lee and Meg Mac. Their former #1 song, “King”, is still in the countdown, but English trio Years & Years makes a desirable debut at #40 this week with the song “Desire”. It is their second U.S. single from the album Communion, which debuted just inside the top 50 on the Billboard 200 album chart a few weeks ago. However, the song entered and peaked at #22 in the U.K. late last year. A “Different” song lands at the top. 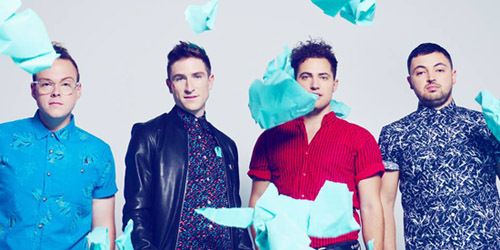 In its 14th week on the top 40, “Different Colors” by Walk The Moon successfully brightens up the top spot, climbing 3-1. It’s the second chart-topper in a row from their Talking Is Hard album. Late last year, “Shut Up And Dance” shimmied to #1 in its 12th week and spent three weeks at the summit. Of course, the song has also become a huge crossover hit over the past few months. Will “Different” provide different results for the band this time around? We’ll just have to wait and see. No surprise here: this week’s Highest Debut is the latest from One Direction and their first release as a quartet. “Drag Me Down” lands at #36 after a huge two days at both radio and retail (at one point, outselling its nearest competitor by a five to one ratio. “Drag” leads their forthcoming fifth studio album, which should be released during the fall. We’ll see if it’ll land a fifth #1 album in a row for the guys on the Billboard 200 listing. Singer/songwriter Martin Luke Brown is heading out of the top 40 with “Take Out Of Me”, a former #8 hit, though he is looking for a top ten once again with “Scars On Scars”, debuting at #38 this week. His biggest single so far, “Nostalgia”, rose to #7 earlier this year and spent half a year on the chart. Brown is currently in the middle of some summer festival dates. Our final debut this week is from the California duo of Daniel Chang and Michael Garner. They are Hunter Hunted, and a nice song from their Ready For You album is new at #40, “Lucky Day”. The track (and the two men) are currently appearing in a series of online ads for Sperry.